Wingsinflight - Bird Misters, Drippers and Puddles! Bird Misters, Drippers and Puddles! Welcome to the "Puddle" page! The original puddle I'm referring to began by attaching a mister to a tree branch which also allowed water to trickle down a branch, dripping off the end and forming a "puddle" on the ground below. I then surrounded this puddle with some small stones and it worked well. 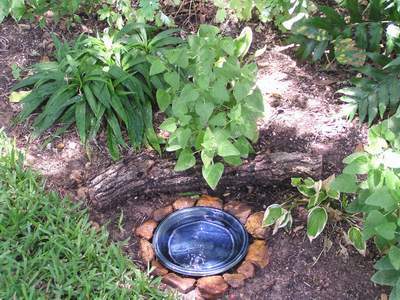 However, since then and to help conserve some water I placed a small plant pot saucer in its place which now acts as a tiny bird bath. The birds have taken to this new puddle just as well and it allows water to be held in it even when the mister is turned off. Timers can also be added to the faucet so you can have the mister come on at a certain time of day or for a set amount of time. On this page I will show the setup I have used and photos showing some of the birds and wildlife attracted to it. 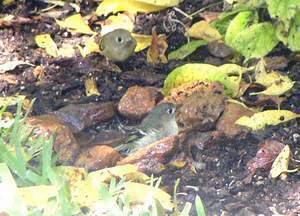 Water attracts all sorts of birds and animals and its fun to watch them discover a new water hole! 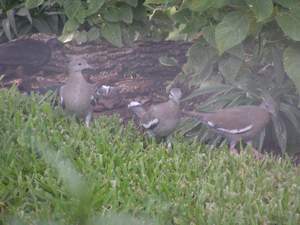 House Sparrow, Starling, Cardinal, Blue Jay, Mockingbird, Chickadee, Ruby-throated Hummingbird, Carolina Wren, Mourning Dove, White-winged dove, Inca Dove, Ruby-crowned Kinglet, Eastern Screech Owl, Dark-eyed Junco, Downy Woodpecker, Yellow-rumped Warbler, Orange-crowned Warbler, Yellow Warbler, American Robin & Squirrel. Bird Baths Unlimited - Birdzilla bird baths. 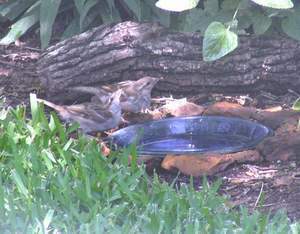 Wild birds Forever - Bird baths and water accessories. 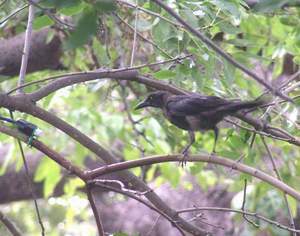 Duncraft Wild Bird Specialists Living with nature... since 1952. 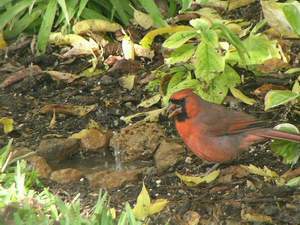 Avian Aquatics Natures way to attract birds! .This mister head, also called a "leaf mister" is like the one pictured here and are used to attract birds and hummingbirds. Many (and probably less expensive) versions can also be found at local hardware stores and be used to the same effect. This particular one can be set to mist or drip, or a combo of both. I attatch it to a tree branch so that the mist sprays over several fine branches which the birds use to sit on while bathing. I also place the nozzle in such a way that when the mist or drips come out they run down a branch. This alone birds seem to love! 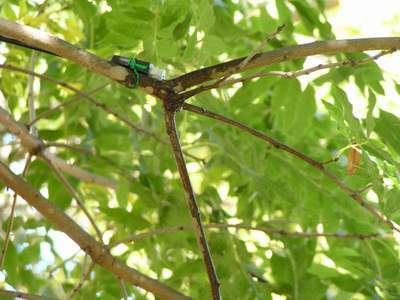 They will perch on the branch, sip off it, rub their belly along it and will rub against any leaves that the mister sprays. 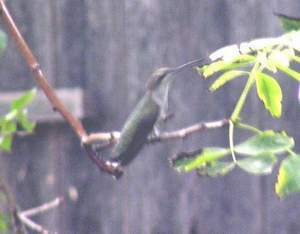 Hummingbirds especially will make use of wet leaves, as well as the fine mist, for bathing. 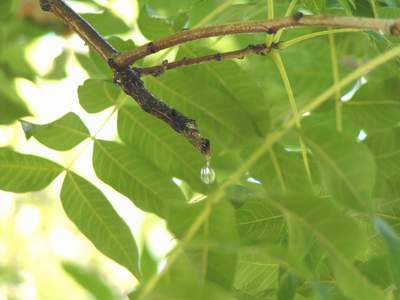 Directly underneath the branch which the water runs down it drips off into the "puddle". 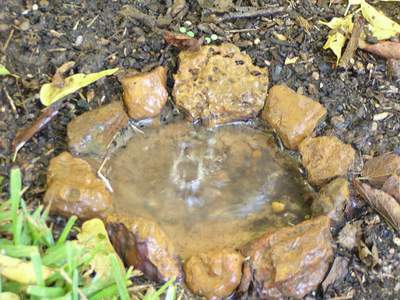 This photo shows the original clay puddle I had before I placed a small plant pot saucer in its place, which catches & holds more water. Here the plant pot saucer is in place and now seems to be just as popular with the birds as the old one. The constant dripping sound also brings birds in to investigate. I have also placed a small feeder nearby. Birds & other animals using the mister setup and puddle. 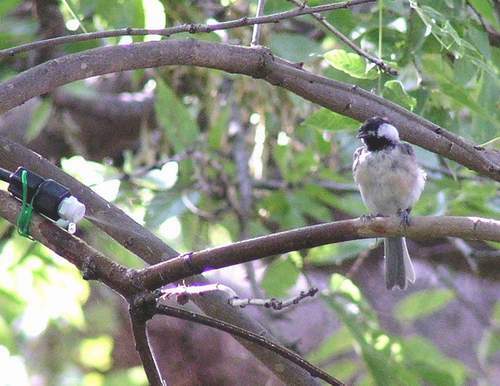 This Chickadee sat in front of the mister for about 20 minutes one hot day! Just sat there! Water was dripping of its tail feathers and he seemed quite content (click to enlarge). 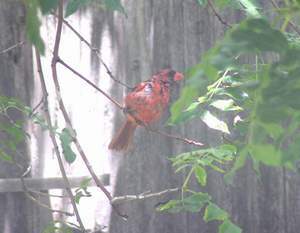 Northern Cardinal in original puddle. He seemed facinated with the drip! Sitting in front of mister getting a good soaking. These guys were having a blast! 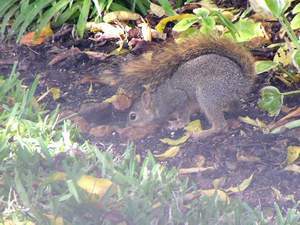 Squirrels often come to the puddle to drink. I've also had an Eastern Screech Owl come down to the saucer at night and drank for a good 5 minutes. A pair of House sparrows come down to the new puddle. He seems to like his new swimming pool! Its also a little larger than the original mud puddle. 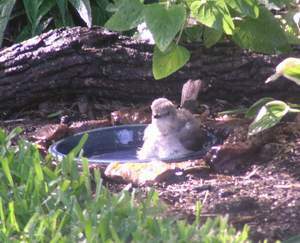 About 8 birds came down in total and took their turn drinking from the bath.